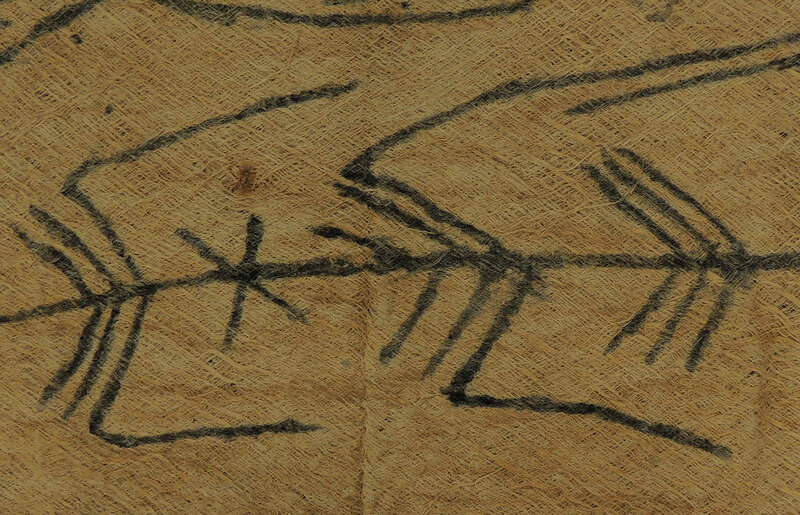 These fascinating cloths with their simple abstract markings are made by the Mbuti people of Congo's Ituri rainforest. Additional information: The Mbuti people who live in the Ituri rainforest of Northeastern Democratic Republic of the Congo, formerly Zaire, are one of the few remaining hunter-gatherer cultures in the world. 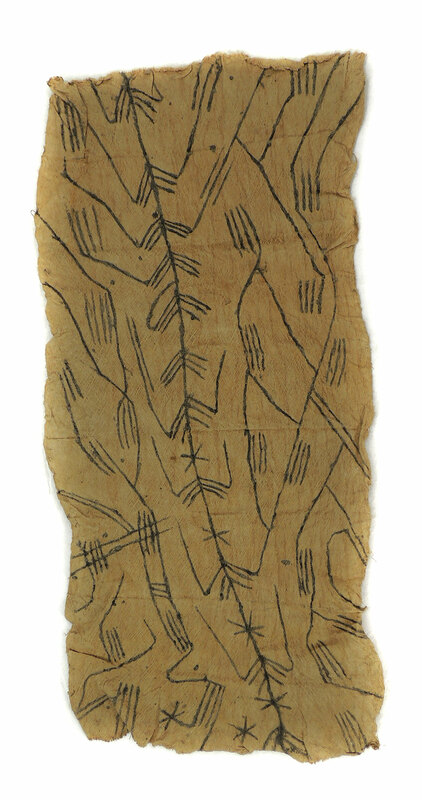 Since 3500 BC, they have been famed for their rich and extraordinary arts of music and dancing, but until recently, the barkcloth drawings and paintings made by Mbuti women have been virtually unknown in the West. Originally made as loincloths for ceremonies and dances, these drawings are sophisticated abstract compositions embodying the qualities of improvisation and syncopation that are associated with the African visual and musical sensibility. Recommended Reading: For more information and similar examples, see MBUTI DESIGN-PAINTINGS BY PYGMY WOMEN OF THE ITURI FOREST. by Meurant and Thompson. Additional Information: The Mbuti people of the Ituri Forest in the Republic of the Congo are among the last living groups who still have a hunter-gatherer lifestyle. The barkcloth paintings done by the pygmy Mbuti women are singularly beautiful. The barkcloth is made from several trees, most often the latex ficus. They are made of bast, which is found between the bark and the sap of the tree. Women and children wear one rectangle hung in front, like a skirt, and sometimes an additional one in back. Men wear one covering the buttocks, brought between the legs to the waist, where it is held by a belt, and draped over the top. A woman chooses the tree and a man cuts the tree and removes the bast, which is then soaked in water, and hammered, two or more times. The pagnes are not painted except for special events. Women do the painting using natural dyes from fruits. The most common blue-black dye is from the gardenia. See Mbuti Design, by George Meurant.